What kind of organizations would best benefit from using Emaximm? Emaximm is a practice productivity tool, which is web-based, so organizations with multiple cases for visas and immigration will find it useful. Because of its light design and powerful server-side technology, Emaximm is not limited to small or large practices. What are Emaximm's unique features? Our new Client Center, a web center separate from the Attorney's Practice Workspace, allows clients/applicants the ability to view and edit their own case information and forms, as well as discuss their cases through Emaximm, rather than email. A corporate HR person, for example, can now view all their cases in a single location, and drill down on each case for further details, as well as make changes to forms, if you want. Also, we have now introduced Syncrodation on our forms, so now you just type once, either on the actual form or on the info sheet and it will update all subsequent forms with your revised information. This can really save a lot of time. There are so many tools Emaximm offers for you to manage your practice. SnapShot is a searchable single area to find all information pertaining to any applicant. Connected to each client's Snapshot is its NetShelf, where you can upload and stack a case's pertinent documents. The Slicer allows you to "slice and dice" all your data for easily customizable reporting serving your firm's many different purposes. Expirations & Deadlines link directly to Scheduler. which is fully integrated with each user's version of My WebDesk and Max Manager now gives you control over your user, client and overall Emaximm experience. Plus, the whole site is instructive, so your paralegals won't find Emaximm too confusing or hard to use. Step-by-step, descriptive boxes guide the user through each module, and a simple click on attached question marks provides instant help. Will Emaximm allow me to replace any of my other information systems or tools? 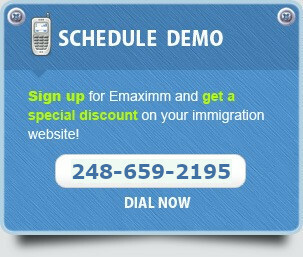 Emaximm is designed to be a centralized web workspace for your immigration practice's needs. The toolset in Emaximm can be integrated into your existing procedures to capitalize on your business' existing strengths. Using Emaximm's full suite will allow you to eliminate the less productive software you use to separately handle your calendars, invoicing, case management, forms administration and contact management. In addition, you can cut costs associated with purchasing, maintenance, licensing and depreciation of supporting hardware and software. We research, evaluate and then acquire the best and most solid systems and then keep it upgraded, and secured. You can concentrate on your core competency. Can Emaximm save my practice any other expenses? Yes! By using our NetShelf to stack case documents, you can save file space both on your computer and in your office furniture. You can also save on overall office space, with the freedom Emaximm gives your entire staff to connect from anywhere online. And in fact, our galvanized reports, featuring the Slicer, provide you with the digital intelligence you need to enable you to cost-effectively control your staff, and even downsize unproductive team members, if required. How many cases will my Emaximm Membership support? 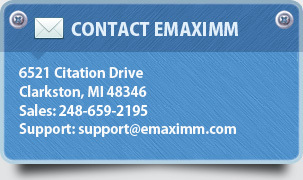 Your Emaximm membership provides for unlimited cases. In the case of NetShelf, it allows you upto 5 GB as part of the membership, but additional server space can be purchased on a month-to-month or annual unlimited package basis. Do inquire about NetShelf special offers, which we frequently present. Where is my practice's data stored? Your data is considered privileged data and is confidentially stored in your database in your space on our servers. The hosting is secured and backups are taken and kept in a bank locker (yes, under lock and key) frequently to ensure 1) the utmost confidentiality; and 2) the quickest restoration of most recent data as part of our disaster recovery plan. Our servers are additionally protected with the same anti-hacker programs as the U.S. Army.. so you can rest easy. OK, I'm ready to join. Now, what? First, test-drive Emaximm and let us know what modules fit your office's procedures. Then, in a day or so, we will custom-build your Emaximm experience for you and you receive free phone training, as well as a quick start guide. That's it, you're on your way. If you have conversion needs, our consulting firm will be happy to suggest cost-effective alternatives. But first, and quick fill our form to get your test drive. We would like to hear from you. Send Feedback.